Yippeekiyay! Three zaps left and my left breast says not a moment too soon since I have redefined red is the new black. It has been so long, yet it has been so fast. And I have survived. I am definitely stronger, and mayhap a little wiser. In other news, the photo today is of IDIOT-1. Kind of like AIR FORCE 1 for the Infiniti-ly more important in this world. This jackass left their giant white refrigerator of an SUV parked a good five feet out from the wall in this parking space, which means that it was sticking out 3-4 feet into the turning lane of a very tight garage. It is also up for debate as to if theat person was actually IN radiation. 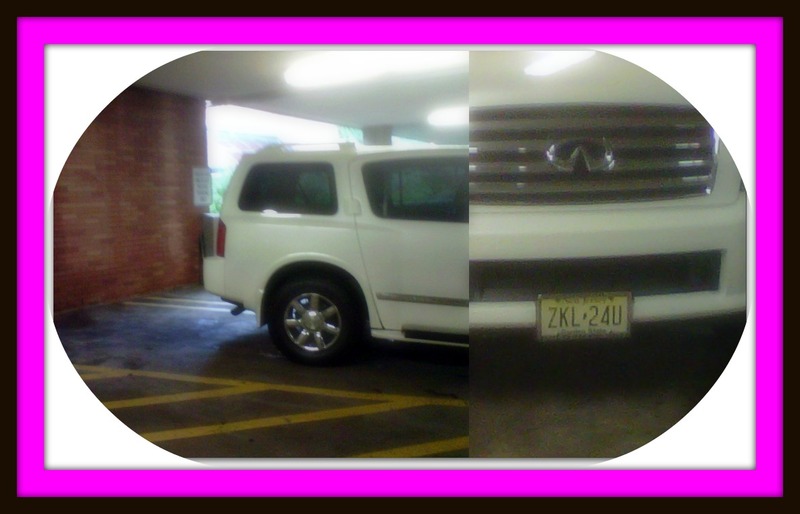 You see Lankenau Hospital where I am getting radiation has a problem with people who park in the “Radiation Patient ONLY” parking. It’s a new spin on people without handicap placards who park in handicap spots because they are too self-important or lazy to park legally. This entry was posted in Uncategorized and tagged breast cancer, breast cancer survivor, flooding, Lankenau Hospital, radiation, rain, Wynnewood. Bookmark the permalink.